Living area: With 32’’ Freeview TV and beams. Shower room: With shower cubicle, toilet and heated towel rail.. Gas central heating, electricity, bed linen, towels and Wi-Fi included. Travel cot and highchair available on request. Welcome pack.. Sitting-out area with picnic bench. 2-acre natural grounds (shared with owner and other properties on-site). Private parking for 2 cars. No smoking.. This cottage is set upon a smallholding in the village of South Kilvington, just a short walk from the traditional Yorkshire market town of Thirsk, where you will find an array of shops, pubs and restaurants along with a splash of local history at The World of James Herriot Museum. There is ample car parking on the area opposite the cottage which is set in a large grassed area with plenty of space to enjoy and is also home to animals such as pigs, sheep and free range chickens. The owners are proud to offer a little guided tour of the land they love so much. 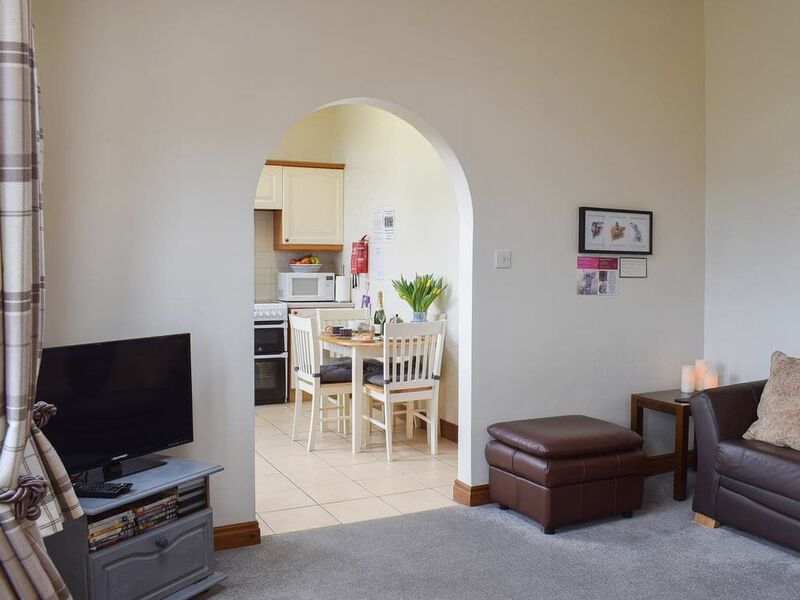 This one bedroom cottage comprises of an open plan living/dining/kitchen area, a bedroom and a shower room. It is all on one level and offers plenty of space for the less agile. Although just a mile from Thirsk you get a real feel for the countryside. The surrounding area is ideal for gentle strolls, more challenging walks or cycle routes with stunning scenery through dales or moorland; the 2016 and 2018 Tour de Yorkshire also passed by. There are many visitor attractions and theme parks within easy reach with Eden Camp Modern History Theme Museum, Flamingo Land and Lightwater Valley plus many historic sites nearby such as abbeys and stately homes. Thirsk is becoming increasingly popular due to its links with James Herriot and ‘The Yorkshire Vet’ but also for its increasingly popular ‘foodie’ scene, lively traditional pubs and Thirsk Race Course. There are golf courses, market towns galore and plenty of things to see and do. The historic city of York is just 30 minutes away, and Harrogate 45 minutes away, both well worth a visit. The famous White Horse of Kilburn and Sutton Bank are 4 miles away, and from the latter you can take the Cleveland Way towards Whitestone Cliff for fantastic views of Lake Gormire, and across the Vale of Mowbray to the distant Pennines just visible in the distance. The mysterious Lake Gormire is tucked away in dense woodland below Sutton Bank, and is one of only two natural lakes in the county, created by meltwater at the end of the last Ice Age and accessible only on foot. Shop, pub and restaurant ½ mile. 1 bedroom (ref. UK2633) and 2 bedroom (ref. UK2634) cottages can be booked together to accommodate up to 6 guests.